Recent oil and gas news has centered on supply factors—especially Venezuela—the reduction in demand growth, the large inventory overhang of both oil and petroleum products, and a particularly big find by Apache in what had been thought to be an unproductive area of West Texas' Permian Basin. This last has only heightened the recent Permian Basin acreage frenzy. While overleveraged energy companies have declared bankruptcy, other operators have cut costs, recapitalized with public equity infusions, and honed operations to fewer areas, chief among them the Permian. US oil production is down to 8.5 million barrels per day (BPD), from a high of 9.6 million BPD in June, 2015, less than expected given the halving of oil prices. 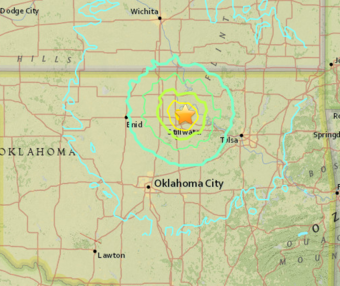 Energy market participants should also note the 5.8-magnitude earthquake whose epicenter was near Pawnee, Oklahoma. Although cutbacks in wastewater disposal well volumes had already been required, the Oklahoma Corporation Commission ordered the complete shutdown of 37 nearby disposal wells. The Environmental Protection Agency, which has sole environmental authority over Osage County, ordered the shutdown of another seventeen disposal wells. However, these cutbacks are small against a framework of 4200 wastewater disposal wells in the state. The 5.8-magnitude earthquake, preceded and followed by smaller quakes and felt from New Mexico to Missouri, will require testing the soundness of much infrastructure, especially bridges and building foundations. Despite the importance of oil and gas production to the state's economy, the reality of the earthquakes and the need to find less-intrusive but more expensive methods of wastewater disposal will impact horizontal well drilling economics in Oklahoma. For more on Alpine High and other topics, please log in now or, if you are not already a subscriber, subscribe now.